Entrance to Serendipity 3, in 2007. Serendipity 3, often written Serendipity III, is a restaurant located at 225 East 60th Street, between Second and Third avenues in New York City, founded by Stephen Bruce in 1954. The restaurant has been the scene of several films, including the 2001 romantic comedy Serendipity. Serendipity was named after the three legendary princes of the island once known as Serendip (now Sri Lanka), from which the 18th century writer Sir Horace Walpole coined serendipity. Serendipity has been popular since the beginning. Marilyn Monroe frequently patronized the restaurant, Andy Warhol was a regular before he was well-known, and First Lady Jacqueline Kennedy was also a frequent guest and once even tried to buy the recipe for the Frrrozen Hot Chocolate for an event she was throwing. Stephen Bruce refused to give her the recipe though he did offer to come and make the frozen drink for her party himself. The recipe can now be found in Sweet Serendipity, a book of recipes and history sold in the general store located inside the restaurant. In 2004, Serendipity celebrated its fiftieth anniversary by introducing the record-breaking Golden Opulence Sundae, listed in the Guinness Book of World Records as the most expensive dessert, at $1000. It is made with three scoops of the Tahitian vanilla bean ice cream, infused with Madagascar vanilla, covered in 23K edible gold leaf, drizzled with the world's most expensive chocolate, Amedei Porcelana, and covered with chunks of Chuao chocolate, which is from cocoa beans harvested by the Caribbean Sea on Venezuela's coast. It is suffused with exotic candied fruits from Paris, gold dragées, truffles and Marzipan Cherries and topped with a tiny glass bowl of Grand Passion Caviar, an exclusive dessert caviar, made of salt-free American Golden caviar, known for its sparkling golden color. It is sweetened and infused with passion fruit, orange, and Armagnac. The sundae is served in a Baccarat Harcourt crystal goblet (which the buyer gets to keep) with an 18K gold spoon, a petite mother of pearl spoon, and topped with a gilded sugar flower by Ron Ben-Israel. The restaurant for a number of years had a location in Boston at Faneuil Hall, but it closed in 1996, and later opened two new locations with one in Boca Raton in South Florida and another at Caesars Palace on the Las Vegas Strip. The Las Vegas location closed in January 2017, leaving the Boca Raton restaurant as the only location outside of New York open. On Memorial Day, May 30, 2011, Serendipity 3 opened a new restaurant on the historic corner of M Street and Wisconsin Avenue in the heart of Washington, D.C.'s popular Georgetown shopping district. However, it closed on June 3, 2014. Like the New York location, the D.C. locale hosted many opulent and playful oddities, including an eight-foot fiberglass smirking Abraham Lincoln statue, designed by high-profile D.C. artist and prop designer A.J. Strasser. The Georgetown restaurant also featured a historical clock from landmark D.C. jeweler Galt & Bros, established in 1802 and one of the longest running business in D.C., as well as a 1960s photograph of Andy Warhol and Serendipity 3 co-founder Stephen Bruce. There is also a Serendipity 3 in Harajuku, in Tokyo, Japan. In February 2019 they released a line of 8 flavors of ice cream pints at 7-Eleven locations around the country. Serendipity 3 has appeared prominently in at least two major movies. The movie most associated with the restaurant is its namesake Serendipity. Released in 2001, it centers on a couple that meet by chance while shopping at Bloomingdale's, and share dessert at the restaurant later that same night. One Fine Day, released in 1996, also has a scene in the restaurant, featuring the Frrrozen Hot Chocolate. Trust the Man, released in 2006, includes a scene of David Duchovny's character being invited to Serendipity 3 by a potential love interest, and then at the restaurant on the first floor eating. The second novel in the Gossip Girl series, You Know You Love Me, includes a scene in which Serena and Dan visit Serendipity 3 and, respectively, order a peppermint sundae and a coffee banana split. The third episode of the second season of Girls mentioned the Serendipity Frrrozen Hot chocolate. E! 's Joan & Melissa: Joan Knows Best? features Joan and Melissa Rivers eating ice cream at Serendipity 3. In November 2007, Serendipity unveiled a $1,000 dessert called the "Golden Opulence Sundae", which Guinness World Records declared the world's most expensive dessert. In May 2012, Serendipity 3 was recognized as the Guinness World Record holder for serving the world’s most expensive hamburger, the $295 Le Burger Extravagant. 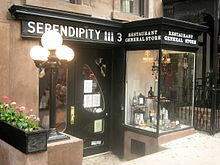 ^ a b "Serendipity 3". Retrieved March 10, 2009. ^ "Ice Cream Sundaes The World's Most Expensive Ice Cream Sundae". Retrieved March 10, 2009. ^ "Boca Raton Restaurants". Retrieved April 13, 2009. ^ "Las Vegas Weekly: Serendipity 3". Las Vegas Weekly. Archived from the original on April 22, 2009. Retrieved April 13, 2009. ^ Martin, Bradley (January 6, 2017). "Serendipity 3 Replaced by Stripside Cafe & Bar". Eater Las Vegas. eater.com. Retrieved February 11, 2017. ^ "Today in D.C. History: D.C.'s Oldest Business Closes Up Shop". Washington City Paper. Retrieved 2019-03-21. ^ "Serendipity Launches a Line of Ice Cream Pints Inspired by the Celebrity Hot Spot's Iconic Desserts". PEOPLE.com. Retrieved 2019-02-17. ^ "Health Dept. Closes Shop Selling $1,000 Sundae". CBS News. CBS News. November 15, 2007. Archived from the original on June 11, 2008. Retrieved February 2, 2009. ^ John, Sullivan (November 7, 2007). "$25,000 for a Hot Chocolate?". The New York Times. The New York Times. Retrieved October 9, 2008.